About Us – OM's Abroad Consult Pvt. Ltd.
Om’s Abroad Consult Pvt. Ltd. is an International Education consultancy with excellent credentials that provides value-based services to aspiring students in Nepal. 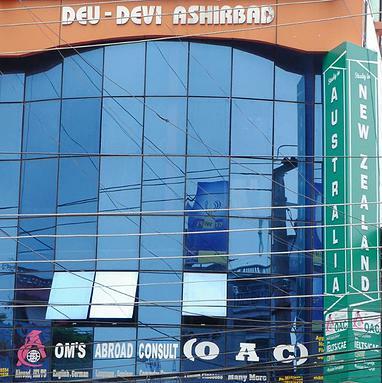 OAC is situated at Mahendrapool in Pokhara. Here you can expect the very best of everything we have got to offer you. OAC came into being in 2009 and has 5 years of experience in international education and has a professional network across international boundaries. We provide professional counseling & expert guidance to students for abroad study and career planning. We also have a highly qualified and certified teachers who will make you proficient in different languages. They will guide you to pass the IELTS, CAE, TOFEL & GRE Tests with exceptional scores. We have well managed, spacious classrooms with computers and internet facility. Therefore you can do self-practice without constraints. It is an open fact that many of our students have scored above 8.0 in IELTS. We will give you a clear vision, hold your hand and guide you along with the right path towards a better future. If you haven’t visited OAC yet, do so today! It costs nothing but could mean a lot for your future. OAC objective is to provide up to date information and expert guidance and counseling to student and guardians who wants to gain international degree and qualification into most renowned educational institutional in Australia, New Zealand, UK and other countries. To be the most trusted and respected professional Educational Consultancy firm recognized by our clients for delivering excellence future career and education.